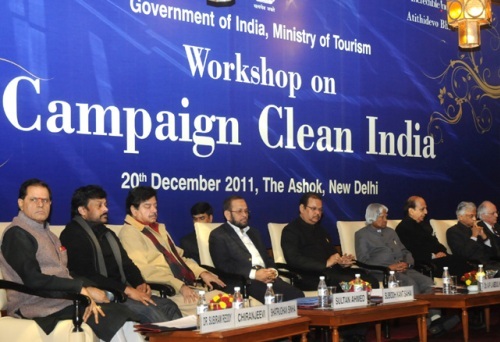 The Ministry of Tourism organized an All-India workshop in New Delhi today to initiate discussions on its forthcoming “Campaign Clean India”. The objective of the campaign is to create awareness about hygiene and cleanliness at tourist destinations and monuments in order to promote these in an even more effective manner. Speaking during the workshop, the Union Minister for Tourism Shri Subodh Kant Sahai said, “Cleanliness and proper hygiene are universally regarded as indispensable existential norms that must inform and permeate all our actions. However, a consciousness in terms of education, demonstration and training is required to be created to ensure that these norms become part of a national psyche, at home and outside it.” He further added, “..conversely, lack of or inadequate personal and environmental cleanliness will have a pull-down impact on the image-India, the worst hit being the tourism sector where the first impression of a visitor is often his last.” The Ministry of Tourism is therefore keen to make an India that impacts a visitor, to begin with, for its cleanliness and hygiene. Inaugurating the workshop former President, Shri A.P.J.Abdul Kalam said that clean environment empowers the societies. He called for converting the fly ash wealth generator for clean environment Shri Kalam suggested that cleanliness drive should be extended to worship places as large number of people gather there. He also suggested the involvement of their students in large numbers in prevention of indiscriminate dumping and better location of garbage collection points. Referring to the Maldives model of tourism Shri Kalam said India can study this model and evolve a total package of turn key tourist systems to be developed by tourist system partners which should include maintenance and upkeep of tourist destinations. The former President also suggested involvement of village panchayats and local self bodies in the campaign. Tourism Minister Shri Subodh Kant Sahai further highlighted the need for such a campaign. He informed that an independent study, conducted at five tourist destinations, has categorized hygiene and sanitation conditions, solid waste management and provision of hygienically maintained public amenities high in importance but low in satisfaction. The Campaign will therefore be expected to correct these weaknesses. Shri Sahai said the success of the Campaign may well decide if the targeted growth specific to tourism would be achieved in the country. Since this ultimately gets connected to job creations, the campaign is also being seen as a poverty alleviation strategy as well. Former Union Minister and former Member of Parliament Shri Shatrughan Sinha and noted cine actor from South, Shri Chiranjivi in their address offered their whole-hearted support to the campaign. They said their services are at the disposal of Ministry of Tourism to carry forward the message of clean India. The “Campaign Clean India” is aimed to undertake both sensitization and action at field level on bringing our tourism destinations and their surroundings to an acceptable level of cleanliness and hygiene. The objective is also to ensure that these levels are sustained through ownership and involvement of private and public sector stakeholders. The campaign will be part of Government’s strategy of the 12th five year plan for improving the quality of services and environs in and around tourist destinations across India. The mission of the Ministry Of Tourism will be to build up an effort that relentlessly sensitizes the people at large to the reality that their own well being is inalienably connected to a healthy sustenance of the milieu that they are part of, including their neighbourhood, their mohalla, their city and finally their country; that the filth and squalor without will eventually get reflected within. The workshop brought together individuals and institutions representing varied interests with a common quest – to see India clean. The Workshop will now see the emergence of action groups, each with a clear functional mandate. Tourism Minister highlighted the need of success of this campaign for achieving the targeted growth rate of 12% in in-bound and domestic tourists arrivals during the 12th Plan. The Ministry will finalize and plan the campaign strategy, incorporating the Workshop recommendations, by 31st March, 2012. The implementation will start from 1st April, 2012. Importance of the campaign has been flagged to the Planning Commission. A Steering Group under the Tourism Secretary will now be formed to take the Campaign forward. PrevNew Delhi Turns 100 as National Capital: Old Delhi Came Visiting with Its Delicacies! Hello friends, how is the whole thing, and what you want to say concerning this post, in my view its genuinely awesome in favor of me.